What would traditionally take many sheets of cumbersome paper or expensive blow-up boards to display is now available in a straight-forward, powerful digital interface. Jurors tend to remember evidence and information that is part of a story. Make your case an effective story using OnPoint Timelines by RPL. Use a timeline to highlight a specific segment of your case, or use it as the platform to present your entire case in chief. 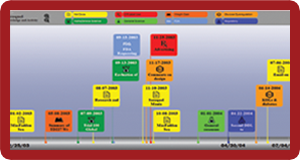 OnPoint Timelines allow you to link timeline events to corresponding documents and multimedia assets. Do more than just point out the date of an accident to your audience; show them photos from the scene, without having to search or switch programs. Go further and interact with documents and multimedia: bring up call-outs, utilize drawing tools, view in full-screen mode, zoom in and out, play video. Link multimedia assets such as documents, videos, images, and third-party software to specific events on a timeline. Create OnPoint Timelines specific to each party or witness, and for a variety of purposes. Create timelines of knowledge, corporate activity, scientific research, driving records, maintenance records, medical treatment and more. Enjoy limitless stylistic choices: layout, background, font, color and more. Categorize events, hide events, link events and/or other timelines, and choose between simple or detailed view. OnPoint Timelines make a big impact in the courtroom, especially when used as a part of the full OnPoint Law Office & Litigation Suite. It's easy to get started on an OnPoint Timeline today! Call us or fill out our contact form today, and an RPL consultant will work with you from there. With your direction and input, we will build a dynamic interactive timeline, designed for use with a specific witness during deposition or trial testimony, or for presentation of your entire case. we build the timeline based on input from you and your experts. You provide names, times, dates and other critical information. We attach discovery and demonstrative evidence to timeline events. we post the timeline for you and your team to review. You tell us any stylistic or content changes you want us to make. you use your OnPoint Timeline to tell the jury an effective story, and present your client's best case!